Happy Monday! Fresh off the weekend and ready for some more fall inspo. One thing that makes autumn outfits so fun to style is the way you can layer your look to meet the day. The east coast is having an identity crisis right now and so you never really know what season you're getting. Chilly days have been few but when we do get them, I love layering chunky, oversized sweaters with camis, blouses and scarves that you can peel off as things warm up. 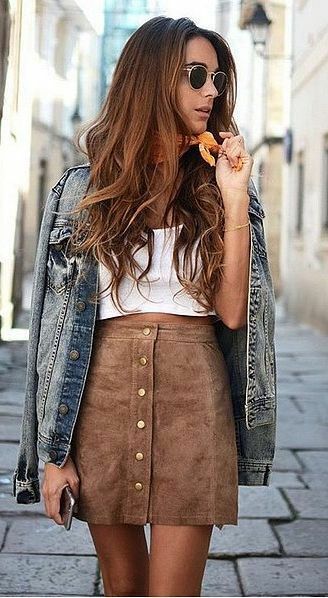 Warm days are made for skirts that can be paired with a great pair of boots and a light jacket draped across the shoulders. I'm also getting into shawls, capes and blazers right now which are all perfect for layering too! What are all of your favorites? Hope you're having an inspired start to your week. Sending you love and chicness...xo!